Carlos Celdran takes the stage once again to tackle all things Imeldific. (SPOT.ph) History has had its share of personalities whose enormity in power is surpassed by their infamy. These people are either ridiculed or glorified in glamorized versions of their lives presented on the big screen. For controversial performance artist Carlos Celdran, however, the "secrets" and the scandals far outshine the glamor and infamy in his re-telling of Imelda Marcos' life through Livin' La Vida Imelda, currently being staged at the Silangan Hall of the CCP Complex. Philippine history is made more interesting because of the tsismis factor. "It's a very gossip-oriented tour so it's also the question on how Filipinos look at our history - is gossip viewed as legitimate history or not?" says Celdran. Most of the story is about the life of Imelda - her humble beginnings as a girl from Leyte, her life as a beauty queen, and then, how she handled the pressures of being a president's wife. Throughout the performance, Celdran manages to highlight how Imelda's personal history shaped the Philippines' own. Some juicy tsismis tidbits to watch for: Imee Marcos' alleged lineage, Imelda dealing with Ferdinand's affair, Imelda's tiara faux pas at Buckingham Palace, the story behind why the Coconut Palace was built, Ferdinand's reaction after Ninoy Aquino was killed and Imelda's nine-hour plane ride to Hawaii during their escape. 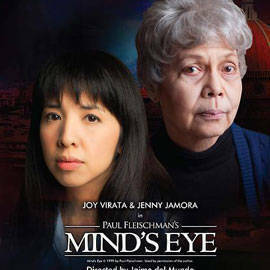 The play is staged at Silangan Hall, an art gallery in the Cultural Center of the Philippines (CCP). Many elements in the story involve the CCP itself and the adjacent buildings, so much like his Intramuros tour, Celdran simply points out the window to illustrate his points. "We still use the CCP and its architecture as the backdrop. Now we're bringing an extra element of theater and historical photographs," Celdran said. "The photographs help activate the story." It also helps to separate the tsismis and the truth. So you know for sure that Imelda danced with Brooke Shields during the one and only Manila International Film Festival because there's a photograph of them. Or that the rumor about Imelda's illegitimate claim to the Ms. Manila crown was not something Celdran made up, thanks to the old newspaper articles he digs up. Aside from the photographs, Celdran also incorporates a multi-media feel into the play. At several instances he uses the screen as an interactive space, where he can "click" certain items, and even browse through images with a wave of a hand. Celdran is the maestro and narrator. The same two people play the roles of Imelda and Marcos, and a chorus line of five take on various roles to aid in the storytelling. They dance to 70s music (at one point even inviting members of the audience to dance with them) and use an interactive stage that cuts through the area where audience members are seated. The cast members approach audience members and talk to them as if they were characters in the story. Not that the play lacked audience interaction - the variety in age among the audience is an experience in itself. 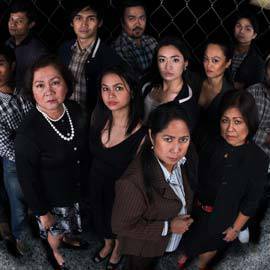 A lola from your left may loudly voice out that she believes a mentioned scandal, and another audience member may reminisce about his or her own experiences during the Martial Law years, and affirm the horrors retold. Meanwhile, the younger audience responds with the usual "ahhs" and "oh?" in moments of epiphany, or maybe even confusion. 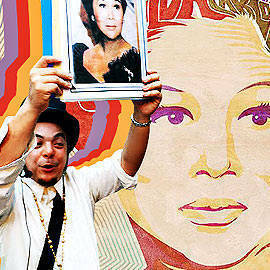 Celdran also inserts his own experiences into the play, recounting his experiences as a child - seeing Ferdinand and Imelda as Malakas and Maganda in his textbooks, not being able to afford SPAM after the EDSA revolution, and his own encounter with Imelda herself, how she referred to herself in the third person while talking to Celdran. So what does Celdran hope to achieve in this tour-turned-show? "I'm hoping that people will start looking around them twice... [from] all sides," he said. "Hopefully what I can do is to get people to actually go out and study the entire history on their own," he added. Indeed, Imelda's story, as Celdran shows, is not just a question of what is true and what is not. It also begs the question of Filipino identity and culture, or if the Filipino earned the right to democracy, or if the EDSA revolution is a true victory for the people or another class struggle that restored a previous order. "Now with the freedom of the Internet and the freedom of free exchange of ideas and information, we should be coming up with our own versions, and our own personal histories," Celdran urged. One thing is for certain however - if our history lessons were presented as animatedly as Celdran has been retelling Imelda's story, no student would fall asleep in class. Ever. Livin' La Vida Imelda is showing at the Cultural Center of the Philippines Silangan Hall at 7 p.m. on November 14, 15, 22, 23, 24, 29, 30, and on December 1. For ticket inquiries, contact (0920)909-2021.